When can I view the cars? 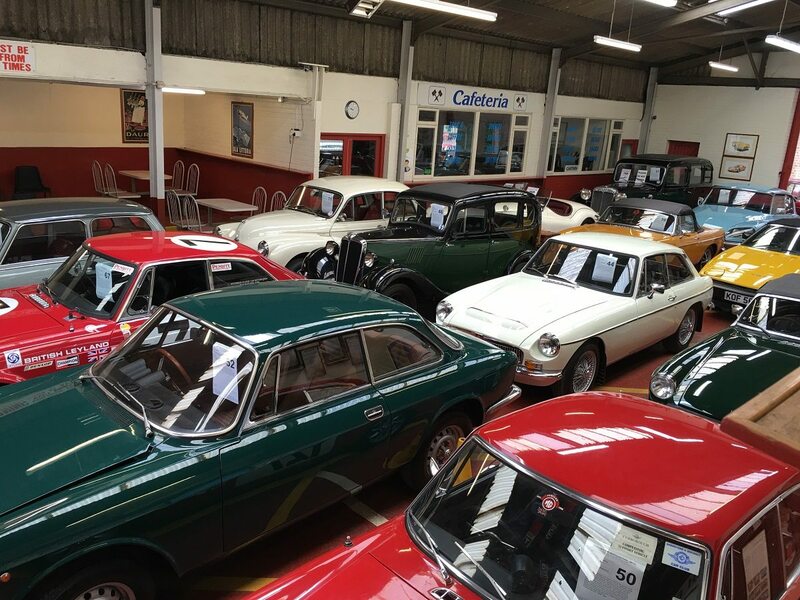 Our viewing days are Wednesday 27th 9am-5pm and Thursday 28th 9am-6pm, all of our cars are also available for viewing from 8.30am on the day of the auction. Do I need to register? Yes. If you are attending our auction tomorrow, you will need to register if you are planning on bidding. You can register by going to our cash desk and buying a catalogue for £5 which will have your bidding number on. What is the buyers premium? The buyers premium is 8% +VAT with a minimum fee of £150 (inc VAT). Where can I park? Parking is available in our car park and in the skate park next door. Remember our classic auctions get very busy so parking spaces are first come first serve! How long to I have to pay the balance if I win a lot? The balance for all vehicles must be paid by Monday (01/08/16). Can I leave the vehicle(s) here until I have arranged transport? As long as the vehicle(s) have been paid for, we are happy to store them free of charge, until further notice. Remember that Friday will be very busy so if you are thinking of registering for any of the remote bidding options, do so ASAP. ONLINE REGISTRATION CLOSES AT 9AM ON FRIDAY 29TH. Our online auction system is a fantastic way to bid remotely. Not only can you view the cars live as they come through the hall, you can also hear our auctioneers as they take bidding. To register for online bidding click here. ALL TELEPHONE BIDS AND DEPOSITS MUST BE SUBMITTED BY 9AM ON FRIDAY 29TH. Telephone bidding is a great way to bid by proxy during the auction. We will call you several lots before the one you want to bid on, then we will talk you through the auction, updating you on the current bid and bidding for you when you tell us to. Phone bidding costs £10.00 and we require a deposit of 10% of the lower estimate, minimum of £500 per car. This will need to be paid with a debit card and your bid will not be valid until we have received your deposit(s) which is fully refundable should your bid not be successful. To register for phone bidding you will need to fill out a “Classic Car Telephone and Commission Bidding Form“. Once you have completed the form you will need to post, fax or email it back to us then we will contact you regarding your deposit. ALL COMMISSION BIDS AND DEPOSITS MUST BE SUBMITTED BY 9AM ON FRIDAY 29TH. If you cannot attend the auction and are unable to bid remotely, you can leave a commission bid on a lot before the start of the auction. Just tell us the lot you want to bid on and the maximum amount you would like to bid. We will then bid for you during the auction, up until either you win the lot or we reach your maximum bid. Commission bidding requires a deposit of 10% of the lower estimate, minimum of £500 per car. This will need to be paid with a debit card and your bid will not be valid until we have received your deposit(s) which is fully refundable should your bid not be successful. To register for commission bidding you will need to fill out a “Classic Car Telephone and Commission Bidding Form“. Once you have completed the form you will need to post, fax or email it back to us then we will contact you regarding your deposit. If you have any questions about bidding on the auction, or any of the cars entered into our sale, please get in touch. Remember that Tomorrow will be very busy so if you are thinking of registering for any of the remote bidding options, do so ASAP.